I want to share some practical things you can do to help you get started or make your time in the word more effective. 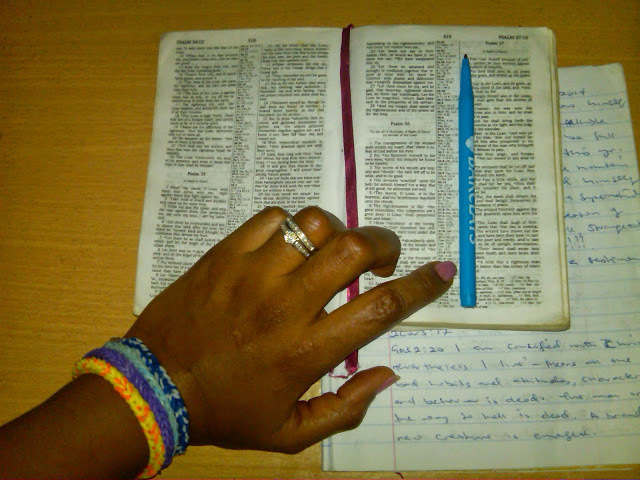 2.Make preparation for your Bible study. Choose a place where you enjoy relaxing and can study-a room in your house where you can be alone or somewhere you are comfortable. 3. Have all your materials available. You'll want your bible, of course, but also get a good bible dictionary, concordance, a pen and paper. That way you dont have to stop every few minutes to go get something. Talk to God about things you may need to confess. Enter your study time peacefully and without anything that may block you from receiving during your time with him. Be encouraged to make out time to study because the word has the power to change your life and help you become the person God wants you to be. No matter when you do it, or how long you do it, God's word will always make a huge difference.